In December 2016, I started experiencing a lot of shoulder pain and then back pain leading to shortness of breath. I went in for an X-ray and MRI, and was told I had pneumonia. I knew that wasn’t correct because I hadn’t been sick enough to get pneumonia. I spoke to my doctor and insisted on being seen again right away. I was sent to the hospital to have a CT scan, which showed fluid in the lining of my lungs. I had the fluid tapped for testing and it was bloody. I was referred to a thoracic surgeon and underwent surgery to have the fluid drained in March of 2017. During surgery they did a scope to look around and found and removed a cancerous mass. I was diagnosed with Stage IV adenocarcinoma lung cancer. I was in the hospital for five days. When I got out on a Friday, I met with my oncologist. They decided to test the mass for genetic mutations. My oncologist called me at home to share the results. I was expecting bad news, but she said she had good news. Genetic testing showed that my cancer was caused by the ALK gene mutation. She told me that having a genetic mutation was like winning the lung cancer lottery because there were very effective treatment options. At the time, Alcensa was still a second-line treatment, but my oncologist and I pushed for me to be able to start taking the drug. It was so new that I was one of the first patients at my hospital to start taking it. Just a few weeks after I started taking Alcensa, it was approved as a first-line treatment. I have some physical challenges that impact me. Some of them are shortness of breath, muscle pain and fatigue. I have nerve pain from my thoracic surgery as well. I am also dealing with mental challenges. I am working fulltime however, I struggle with memory loss, focus and vision issues, all of which are side effects of my treatment. I also deal with some depression. I explain it to family members as mental torture. You try to enjoy living but, you are always aware that your life can be cut short at anytime. The cancer consumes your thoughts 24/7. That is really hard. 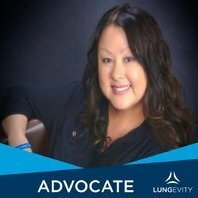 I recently became a member of the ALK Positive Facebook group, which led me to LUNGevity Foundation. ALK Positive has partnered with LUNGevity for a research grant for our cause. It’s a great partnership. I wish I would have known about LUNGevity and the ALK Positive online support group right away. LUNGevity really advocates for patients. They are such a great source for support and information. I noted that they share survivor stories and I immediately decided that I wanted to share my story with others. The more we talk about lung cancer, the more others learn and we can get rid of the stigma. Putting faces to this disease makes a real impact. I would tell a newly diagnosed patient to reach out to support organizations like LUNGevity. Knowledge is power and there is hope. The more you know about this disease and advocate for yourself the better off you will be. It’s a scary road but a little easier when you find good support sources. Survivorship means I am living with this disease. I hope to keep living with this disease for many years and provide support and advocate for others. I do not want to sit and wait, I want to take action to help myself and others as much as possible. We need to fight for more research funding and to make others aware of this disease. I hope to touch others with lung cancer and inspire them to share their story and find their voice to advocate. I want to get the word out about ALK lung cancer and remove that stigma that it’s a smokers’ disease. Whether you smoked or not doesn’t matter. If you have lungs, you can get lung cancer. I hope that as others find their voices too, we can get the word out about how we lack sufficient funding for research. That is really important to me. 433 people die each day of lung cancer – we have to change this!